The countdown is officially on! It’s hard to believe that we are less than two weeks away from DECEMBER 1st. Have you marked your calendar? DONT WAIT! Book your appointment now, spots are filling up quickly! Call us directly at the studio 410.988.5563 to schedule your appointment today. We couldn’t be more excited to announce our sponsors for Santa Paws!!! We have received such great support and participation from local businesses, our furry four-legged friends are in for royal TREAT! Together we can make a difference for Maryland’s animals. We would like to recognize all of our sponsors for making such generous donations! We truly appreciate everything from the doggie bags and treats to gift certificates and baskets filled of goodies for our raffle, we couldn’t have done it without your help. Dogs & Company. Columbia, Maryland. What better way to get into the holiday spirit than by having pet portraits taken with International Award Winning Photographer, Pam Long. Your favorite four-legged friends can enjoy a fun photo shoot AND help local animals in need. Through our Santa Paws Charity Event we will be raising funds, awareness and pet food donations for a local animal shelter,Animal Welfare Society of Howard County. Together, we can make a difference for Maryland’s Animals; $30 of every $60 session fee will be donated to the Shelter. This price covers a mini portrait session with a pet. Those who bring a bag of cat or dog food to donate will also receive a complimentary 5X7 portrait (Value $59) with your order! Special package pricing for this event! Packages begin as low as $149! If you missed our original you can read more about it by clicking HERE. 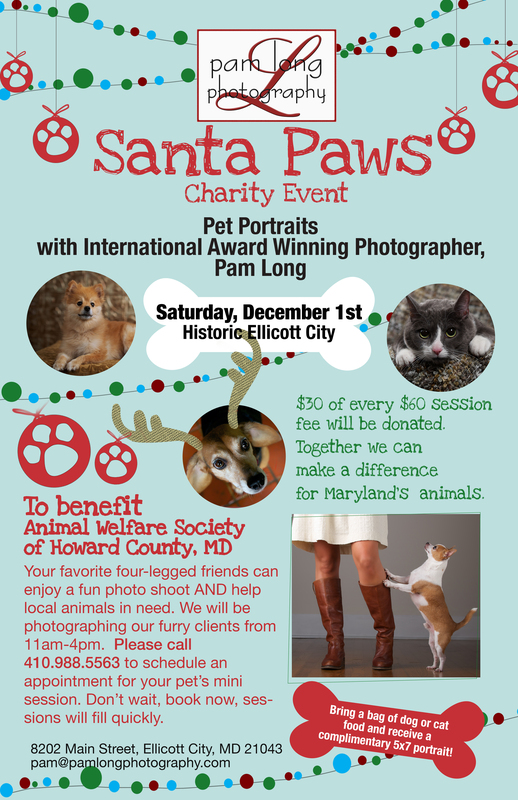 Pam Long Photography is thrilled to announce our upcoming Holiday Charity Event, SANTA PAWS. What better way to get into the holiday spirit than by having pet portraits taken with International Award Winning Photographer, Pam Long. You won’t want to MISS this event! Mark your calendar for SATURDAY, DECEMBER 1st, 11:00am-4:00pm. CALLING ALL ANIMAL LOVERS. Your favorite four-legged friends can enjoy a fun photo shoot AND help local animals in need. Through our Santa Paws Charity Event we will be raising funds, awareness and pet food donations for a local animal shelter, Animal Welfare Society of Howard County. Together, we can make a difference for Maryland’s Animals; $30 of every $60 session fee will be donated to the Shelter. This price covers a mini portrait session with a pet. Those who bring a bag of cat or dog food to donate will also receive a complimentary 5X7 portrait! Special package pricing for this event! Packages begin as low as $149, print prices as low as $59! Sessions will be available throughout the day on an appointment basis only. Please call the studio 410.988.5563 ASAP to schedule an appointment for your pet’s mini session. Don’t wait, book now, sessions will fill quickly. First 5 clients get a free flashlight keepsake keychain! We’re looking forward to announcing some of the generous gifts that our pet friendly businesses have donated as raffle prizes! You are invited. GIRL’S NIGHT OUT! Can you believe it’s already NOVEMBER?! Crazy how fast time goes by; seems like just yesterday it was summer! Now we are well into fall with boots, scarves, and pumpkin lattes. Want a night out on the town? Jump start holiday shopping? Come to Old Ellicott City and take advantage of an exclusive Girl’s Night Out discount in participating stores. We are gearing up for the third Thursday of the month, the fabulously fun GIRLS NIGHT OUT. You are invited to an awesome night out on the town of eating, drinking and shopping. Round up your girlfriends and head down to Historic Ellicott City Thursday, November 15th, from 5:00 to 9:00pm. This week, we are extremely excited to feature Scentsy! Many clients inquire about how good the studio smells, so why not share our little secret. We couldn’t be more thrilled to have a Scentsy Wickless rep on hand for the event! Scentsy offers a full line of wickless candles (warmers and wax), as well as body products, and other fantastic, scented items. Our rep will have a full line of cash and carry items, as well as the opportunity to place orders for items that aren’t on hand. All orders will be delivered to our location for your convenience! Get your holiday shopping done early!!!! Begin your journey here at Pam Long Photography before exploring down the marvelous Main Street. Come hang out and mingle with international award winning photographer, Pam Long. Pam has a love for photography that is only matched by her passion for life. Enjoy sparkling cocktails and have fun in our very own studio photo-booth! We look forward to seeing you this Thursday, November 15th for Girls Night Out!